First Clues Reviews: The Secret of the Lonely Grave by Albert A. 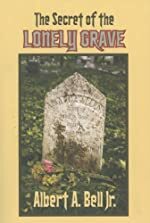 Bell Jr.
Review: Put your seat belts on and get ready to go on a wild ride because the book The Secret of the Lonely Grave written by Albert A. Bell, Jr. is jumping to the top 10! There are two other secondary characters in the story too, Dwayne Mitchell, a school bully who finds out that having a friend might help him get away from his crazy dad, and Doc, the “Flower Freak” who guides them to Steve and Kendra’s journey of a lifetime. Here is a little summary of what the book is about, but you have to read the rest if you want to find all the suspense stuffed in that book. The lonely grave has been abandoned and neglected for a very long time. But 150 years of silence is good enough for two friend, Steve Patterson (a white boy who really likes baseball and is a kid of age 11), and Kendra Jordan (an African American girl who likes Sherlock Holmes, age of 11 too), to embark on a mission to solve the mystery once and for all. The Secret of the Lonely Grave is a phenomenal book with really suspenseful parts. My favorite part though is when Steve and Kendra get trapped in the tunnel and have to put their minds together and figure out how to get out of the hole. And my second favorite part is when they find Doc, the “Flower Freak”, but if you want to find out who that is then you have to read the book! This book accommodated very good visualization, and also upheld some character contrast between the different race color involved in the plot which brings me to the fact that the plot was satisfying, and honorable. But I’m not the only one who loved The Secret of the Lonely Grave. This book is so good, it got two awards: the “Evelyn Thurman Young Readers Award” and the “Mom’s Choice Award Honoring Excellence”. This book deserves a 5 star rating because it has so much suspense and will surely give anyone a laugh! No wonder it got a quote from Book Review Café saying, “What a fantastic book” and one also from MyShelf.com saying, “… an entertaining mystery that even adults could enjoy. It has some memorable characters, as well as lessons about why hatred and bigotry are wrong … while they learn, kids are treated to a great can’t-put-it-down mystery.” This is why I think the book The Secret of the Lonely Grave is a wonderful book. And I’m even reading the second one in the series, called “The Secret of the Bradford House”. I can’t wait!! !